Plans for Saturday evening? If you like cask beer, appreciate hand crafted woodwork and dig fine cuisine using Vancouver-grown veggies (ours), join us at the Railway Moonshiner! 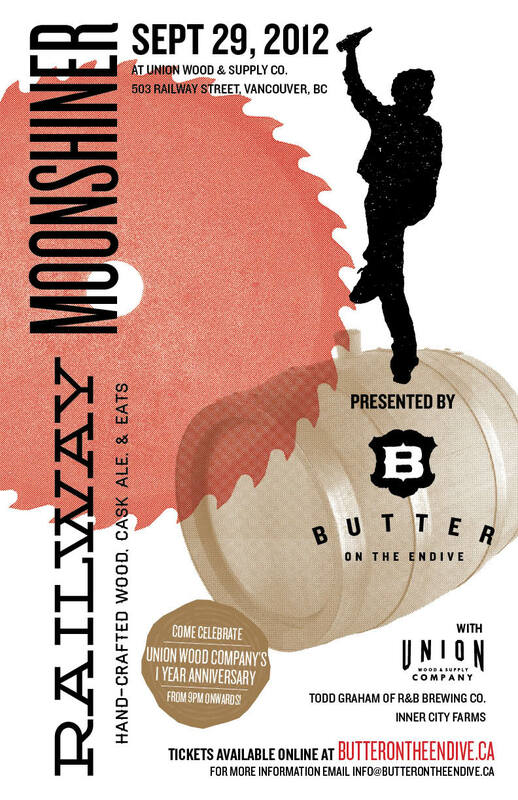 This is a special collaboration put together by the fine folks of Butter on the Endive accompanied by the head brewer from R & B Brewing Company and located at Union Wood and Supply CO's digs. For a glimpse of the woodworking artistry, check out this article from Scout magazine - pretty amazing. You can get a preview of Chef Owen Lightly's menu for the evening here, but you have to be present on Saturday night to experience Todd Graham's cask.